Maine-ly Kayaking: An Interview with Maine's JCass By Alex DePue | DBP MAGAZINE ONLINE The World's Best Free Whitewater Publication. Maine is a little known paddling destination sitting in its own little corner of the world. Yet this state hides some of the best whitewater in the world in its Northern reaches. Whether you are looking for play boating, burly class 5, expeditions, or first descents Maine has you covered. Much of Maine’s vast expanse of wilderness is far off the beaten path and will require hiking in (potentially multiple day treks) to reach rivers. Meet Jeremy Cass, Maine resident, layaker and explorer. 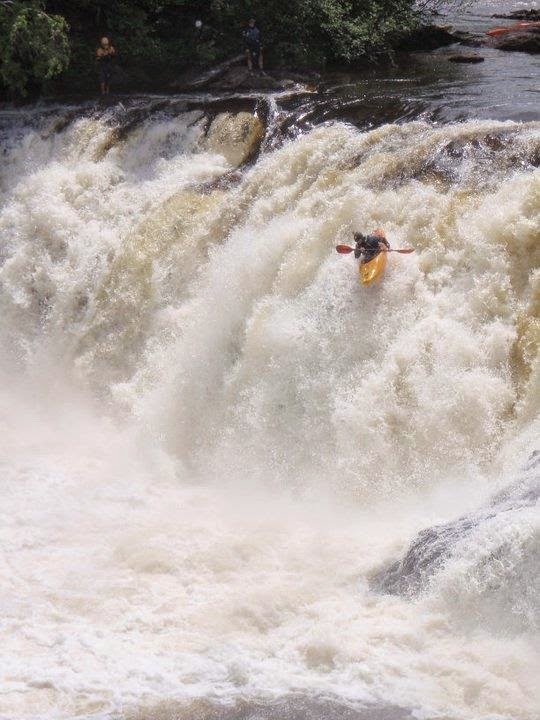 In 2011, Jeremy along with Chuck Mathieu, Josh Geib, and Chris Hull hiked their fully loaded (80-100lbs) kayaks nearly 7 arduous miles into Wassataqouik Stream, the top 9 miles (were they put in) of which contained un-run class 5 rapids followed by another 16 miles of class 4 (wassatqouik stream expedition). Jeremy has also been apart of crews that have embarked on kayaking trips all over the world including Alaska, Slovenia, Mexico, and Switzerland. Besides being one of Maine’s most Elite class 5 paddlers, Jeremy also owns a whitewater kayak instruction service, and organizes kayaking events in Maine that paddlers from all over New England come to be apart of. He also, has a “real” job. Jeremy is a Licensed Clinical Professional Counselor (LCPC) in the State of Maine who works with public school and clinical counseling centers regionally. With a total 9-5 everyday gig, he still finds time to teach and send. DBP: How did you get started in kayaking, and what was it about kayaking that really drew you in and made you so passionate for it? Jeremy: I’ve been involved in both surfing and paddlesports fort a long time, but started whitewater kayaking at Camp Highlander in North Carolina on the Nantahala River when I was about 11 years old. However, I really got into kayaking when I started at Unity College which had an Adventure Education department that taught sea-kayaking, whitewater canoeing and expeditioning, and gave access to its whitewater kayaks. I would paddle for class, and almost every weekend on the rivers and oceans nearby. DBP: Maine has a rather small and unique paddling scene. What is it about Maine’s whitewater and boating community that make it special for you? Jeremy: For me, it’s really about the quality of the rivers. The geology is unique in the sense that it mostly creates clean, pool drop style rapids and falls. We have great vertical waterfalls that are pretty good for the North East, let alone the East in general. Also, most rivers start in a swamp which makes them hold extremely well and run for a long time. Lastly, we have several major rivers systems that are dam controlled (the Kennebec and the West Branch of the Penobscot) that serve up everything from big water class III to technical class V every single day. Also, much of it is far off the beaten path, creating a great wilderness feel to almost every run. Luckily, over the past ten years I have worked on the West Branch of the Penobscot which draws some pretty dedicated kayakers. They were kind enough to help me gain my creeking wings. Eventually our friendships have grown beyond the kayaking and sharing life changing events like attending each other’s weddings and celebrating the birth of children. DBP: Recently, you were featured in entries for Rider of the Year Awards (awesome lines by the way). Where do you see your paddling going in the future? Jeremy: Yeah, I was pretty honored to have my line in Hagas next to the biggest names and drops in the world, and really I’m nowhere near most of those folks. I also got an entry into the 2011 RTY as well for a line on Smalls Falls, but again – it’s pretty humbling to see the magnitude of what’s being run out there. For the future I am really focused on longevity, genuineness and soul. I still want to style awesome drops, but not at risk of dying. I just want to have the best most funnest line through the biggest and baddest class IV possible, but still run good class V in ideal conditions – In other words making it fun and challenging while reducing the risks as best as possible through teamwork, good water levels, scouting, portaging, and thoughtfulness. DBP: Do you want to keep pushing forward and running bigger and bigger things? Jeremy: I want to try new things that challenge me in different ways, which in some cases equates to bigger. For example I want to link longer stretches of river together as overnights, even if there is some heinous flatwater involved. I want to stay healthy and enjoy the time I can on the water without the stress of thinking about how I can outdo myself on the next trip. Though, I do want more far away trips hahaha. Pushing forward at this point is really about staying with whitewater, rather than burning out of it. DBP: What is the biggest drop that you have ever run? The hardest? And the most challenging or scary for you personally and why? Jeremy: Biggest is probably still Oceana on the Tallulah in GA, and or Grand Falls of the Dead in ME. 60 ft of slide or about 35 feet of freefall is pretty good for someone with a 9-5 job. Hardest is still probably Jaws on Gulf Hagas – you’re pretty much running a locked in siphon, and it’s extremely difficult to portage. If it’s highwater you’re fucked and portaging for hours in a deep wilderness (luckily I have never had to do this). DBP: How do you motivate yourself to get past the fear of running these drops, and how do you help your students cope with the same fears? Jeremy: Motivation is really hard sometimes, especially after I nearly drowned in 2012. I had major PTSD from it, and no one understood. For a while I couldn’t trust anyone on the water or feel motivated to kayak, it felt awful. However, I found that taking little steps, meditating, starting at super easy stuff that I enjoyed, and connecting with my most core crew eventually rejuvenated me. I help my students with this stuff by just trying to connect with them on a personal level, and understanding where they are at first – then we work on how the body boat and blade generate energy to run the river second. DBP: You teach advanced whitewater kayaking and swiftwater rescue. What inspired you to teach others to kayak? Jeremy: When someone shares a river they love with you, it’s a gift. I want to give that gift, because I’ve received it and someone took the time to give it to me. Also it’s a lot of fun seeing someone having a blast on the river, and investing the time to take its technical aspects as seriously as I do, at leas for the weekend haha. Seriously though, there is so much to whitewater that a video, a friend, or mentor cannot covey without proper training and experience, and I’ve taken the time to become as proficient as possible to transfer that information to the public to make paddling more, safe, more accessible, and help people go bigger longer. DBP: Could you tell us a little bit about your typical program (intermediate level lets say), how a typical weekend unfolds, and what skills students can expect to go home with? Jeremy: I utilize a progression of river features that compliment each other increasing from easy going to more complex and powerful. Each day tends to feed into the next, as does the river venue so the students can transfer what they learned the day before into a new situation. Within that framework occurs all the technical aspects like strokes and maneuvers, river hydrology, and rescue theory and practice. Without talking too much, I try to let the river do a lot of the teaching as well, because it will really give you the best feedback. DBP: Looking forward, what are your goals for 2015? Do you want to plan any new events? Are there any new goals you have for Maine’s whitewater community as a whole? Jeremy: For 2015 I plan to be more targeted in my instructional delivery. That means a core group of courses with my existing industry partners and the American Canoe Association. This gets as many people involved as possible, and strengthens the existing guiding and regulatory systems here in Maine and the region. Expect one major advanced course, and another in Swiftwater Rescue. I will also lend my safety and rescue expertise to select extreme whitewater races as my schedule allows. Also, I just want to style waterfalls and have fun. Thanks Dirtbag’s I really appreciate your time, humor, and fresh contributions to whitewater river riding for everyone!